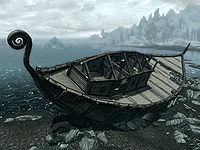 The Wreck Of The Brinehammer is a ship that has run aground, located northwest of Dawnstar, along the shores of the Sea of Ghosts. It has an exterior—the deck, cargo hold, and the surrounding area—and one interior zone: The Brinehammer Below Deck. The exterior of the wrecked ship has very little to explore. Several skeever corpses float in the water to the north of the ship, amid some wreckage. To the southeast is a small pool filled with several clams and a corundum ore vein. A nirnroot can be found immediately west of the ship, and another immediately to the north by a silver ore vein. Somewhat west of the ship is a third nirnroot and over a dozen slaughterfish egg clusters. Further to the west on two small islands there are two more nirnroots, three quicksilver ore veins and some stone ruins. On the deck of the ship there are several mudcrabs. Facing northwest, there is a structure with stairs leading down to a door to the interior of the ship. There is also a door leading to a cabin on deck open to the sky. In the cabin there is a skeleton on a bed, crushed by a chest. It is also possible to enter the ship's interior via either of two doors located in the cargo hold, which itself is accessible by jumping up through a hole in the hull of the stricken vessel. The cargo hold is inhabited by a lone mudcrab and contains a skeleton on an unusable bed roll. Beside this is a crate with a copy of the Archery skill book Father of the Niben on top and a bottle of wine. There are also two barrels of ingredients and an adept locked chest. Underwater near the stern of the ship is an apprentice locked chest. The interior of the ship is inhabited by a few mudcrabs. It is in chaos below decks due to anything that wasn't secured being thrown around when the ship ran aground. There are numerous sacks of food found throughout the ship. Near the first mudcrab below deck and a horker mounted head amidships, a copy of the Enchanting skill book Catalogue of Armor Enchantments can be found on the floor. There is a novice locked door on your left. Continuing along the side of the starboard-side hull. There is another mudcrab concealed by a doorway into a cabin and just after this is the skeleton, that can be looted, of an unfortunate person who was crushed by moving cargo. Past this towards the aft of the ship is a set of shelves holding several pieces of ore: two of gold, two of silver, a malachite, a corundum, a moonstone, and an ebony along with two silver ingots. At the front of the ship is a novice locked door leading down to the cargo hold with a ramp up opposite to a storage area, where an open crate holds a selection of random strength potions; two potion of healing, a potion of stamina, a potion of waterbreathing and a potion of strength. A second open crate holds a bottle of alto wine and four bottles of wine. Following the deck around to the port side, there is another mudcrab in the second section on your left. At the end of the passage is a cupboard on its side with six common books on the shelves. There is also another skeleton that was crushed during the grounding. Just before this the passage is staggered to the left, where you will find an unlocked chest. To the right of this are two sets of shelves with eight common books, two bunches of lavender and a small coin purse either on the shelves or on floor in front of them. Between the shelves is a shrine of Kynareth. At the end is a dresser on its side containing common clothes and a doorway into another passageway. There is the novice locked door seen previously on your immediate left. Beyond this there are three stacks of three bunk beds built into the left-hand wall, with the bottom ones available to use. A dresser is between the first and second stacks, with a common book on the floor in front of it. The passage ends at an unlocked door leading down to the cargo hold with another mudcrab concealed in front of it. You can swim underneath the wreck and enter the cargo hold through a hole in the hull by jumping from a certain angle. Southeast of the wreck, you can find an overturned skiff sheltering two mudcrabs. Underneath the boat you can find a knapsack containing some loot, and a copy of the Alteration skill book Daughter of the Niben. Using the northwest door in "The Brinehammer Cargo Hold" exiting to "The Brinehammer Below Deck" may place you beneath the floor of the 'below deck' zone. ? This can be avoided by returning to the cargo hold and using the other (southeast) door. Various snags exist where you can be trapped and not get free without using console teleport commands exist around the edges of the Brinehammer, specifically where you walk up walls, etc.